Future sustainability of organic and low-input milk production: Challenges and solutions. Workshop on 26-27 January 2016 at the Novotel Bristol City Centre, Victoria Street, Bristol BS1 6HY, aimed at organic and grassland based dairy producers using a low-level of external inputs. There will be a full programme of SOLID dairy workshops and plenary on the 26th January with a further workshop on organic dairy nutrition on the morning of the 27th January for those that can stay on. In addition there will be many workshops of interest to SOLID delegates in ORC's Organic Producers' Conference programme onthe 27th and 28th January at the same venue. The Sustainable Organic and Low Input Dairying (SOLID) project will be holding this workshop which is jointly organised and supported by ORC, OMSCO, Aberystwyth University and AHDB Dairy. 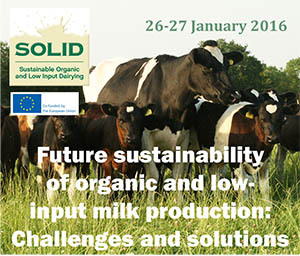 The conference, aimed at farmers, consultants, scientists, dairy processors and feed producers, will present and debate the outcomes of the Sustainable Organic and Low- Input Dairying (SOLID) project. We will focus on practical strategies to implement the findings of the project by farmers. Speakers from project partners across the EU and other organisations and will introduce the challenges of low-input and organic milk production as well as reporting on project results in relation to breeding objectives, breed choice, forage utilisation and animal health. Farmers who were actively involved in the project will present their experiences. Would you be interested in exhibiting at or sponsoring the event? We are expecting around 100 delegates for the SOLID conference and 200+ for the Organic Producers' Conference, providing a unique mix of producer, researcher and adviser input to enable sharing and discussion of the latest innovations with respect to organic/agroecological approaches to sustainable food production. If you are interested in exhibiting at or sponsoring the event please see the different levels of sponsorship, and cost of a trade stand in our Sponsorship flyer. For more information about the conference programme contact Konstantinos Zaralis.